In developing Via Roma, there was the clear intention not to follow the conventional path for Private Brands. It had to be different, and the brand strategy had to reinforce the authenticity of the product. The tagline “Italian Food with Personality” became the guiding positioning for the brand seen in its design and marketing, and five years after its creation, Via Roma’s emotional sensibility truly stands out versus the competition. DO YOU HAVE A BRAND PORTFOLIO YOUR SHOPPER LOVES? The old private label is dead, and in its ashes rises a desire to create proprietary brands that consumers truly care about and have loyalty to. This requires a new mindset, enlightened consumer and brand segmentation, and marketing that embraces all media. – How do I make my private brands distinct and differentiated? – What is the category and tiering architecture? – What destinations should I build within the portfolio? – How do I sustain, service and market my program differently? 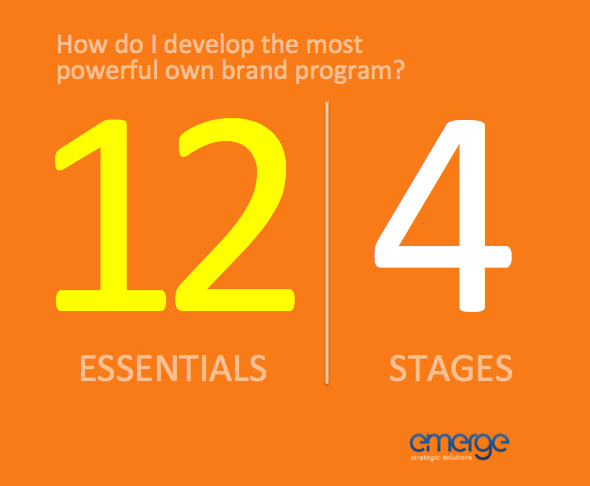 In developing the most powerful retailer-brand program, there are 12 Best-In-Class essentials that set the standard for you, and 4 stages of development. Ask us to hear more about these proven facets.